On Sunday, Wasted Tears hung on by a nose to win the John C. Mabee Stakes (gr. IIT) in a thrilling finish. Remarkably, it was the 10th consecutive victory on turf for the 5-year-old mare, half of them coming in graded stakes company and all of them coming in wire-to-wire fashion. It's been an amazing two-year run for the undersized daughter of Najran, especially considering that she is based at little Retama Park in Texas for her owner/breeder/trainer Bart Evans. Both Retama and Evans are not exactly household names in Thoroughbred racing, though Evans is well known on another professional circuit: He was an outstanding polo player for many years and was inducted into the Polo Hall of Fame in 2001. A Texas native, Evans began training race horses in the 1990s, but Wasted Tears is his first graded stakes winner. As you can see by the following Q & A, he feels privileged to have a mare like Wasted Tears, who earned a spot in the Breeders' Cup Filly & Mare Turf (gr. IT) in November with her Mabee win. And even if she doesn't make it there, she has already won graded stakes at some of the nation's best racetracks, including Keeneland, Gulfstream, and Del Mar. It's more than Evans could have ever asked for. JS: I see Wasted Tears does most of her training at Retama this time of year. Is that your base? BE: I use three tracks: Lone Star, Retama, and I'm in Florida (Gulfstream) in the winter. I have 16 horses in training. JS: Wasted Tears was bred in Kentucky. Do you have a farm there? BE: No. I had a very good friend, Bruce Hundley at Saxony Farm (in Versailles, Ky.), and I kept quite a few mares there. The mare (Wishes and Roses) has been there for most of her life, though I did bring her back home last year to breed to Elusive Quality. JS: How did you acquire Wishes and Roses? BE: I bought her at the Keeneland yearling sale (in 1992 for $20,000). She was fairly correct and caught my eye. So I followed her and said, ‘I'll see what she brings.' I bought her and I sent her to Jeff Williams in Florida. (Wishes and Roses won three of six starts before becoming a broodmare, including a minor stakes at River Downs in 1993). JS: You didn't train horses at that time? BE: No, I just bought a couple of horses; maybe one or two per year. I started getting into training around 1996. JS: Was it difficult adjusting from polo to training horses? BE: Well, both sports involve Thoroughbreds, so my polo background helped. I knew something about (training). In polo, horses have to stay very fit. We sometimes have three games a week. When is the last time a Thoroughbred had three races in a week? But that's the beauty of Thoroughbreds; they come in all shapes and sizes and they can do many different things well. I love them. With polo, I got to travel all over the world and got paid to play a game I love. After I was done, racing always intrigued me, so I decided to give it a try. JS: Did you know Wasted Tears was special from the start? BE: I knew she was a little bit different. When she was a baby, she was more aloof than others. She wasn't mean, but she would let you know when she wanted or didn't want something. I could sit here and tell you I knew she would win 10 in a row, but I'd be lying. Anything can happen in horse racing. I might have rushed her too much early on (she was sent right in stakes company after breaking her maiden at first asking in 2007).But she also had (physical problems). She had a problem with her ovaries, and after the Quija Board (Handicap in 2009 when she set the one-mile course record at Lone Star for her first stakes win) she had a staph infection of the spinal process. It took her a while to get over that. JS: This year she has won all five of her races. They have all been on the front end and by close margins. I guess her running style contributes to the close finishes? BE: She likes to lope along on the lead but she does it easy; it's not like she struggles to do it. It's just the way she likes to run. She likes to have company run with her but once they get to her she seems to find more. It's like she's saying, "you're not going to go by me.' It was like that on Sunday (in the Mabee). JS: The Mabee was her first time going nine furlongs. Did running that distance concern you at all? BE: Not really. Her best race was when she won at Keeneland (in the Jenny Wiley). That was at a mile and sixteenth and I don't think they would have gone by her if it was a mile and an eighth. JS: She's a small mare isn't she? BE: Yeah, we weighed her a couple times and she is a little over 1,000 pounds and 15-3 (hands). It's probably advantageous for her because a big, heavy mare would get into the turf a little more. JS: What is the plan for her? 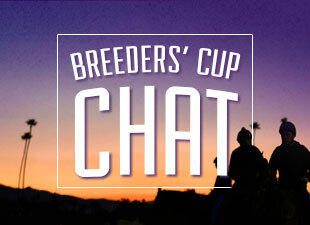 I read that you don't think the Breeders' Cup is in the cards because the race is at 1 3/8 miles. BE: We'll see what happens. I'd like to get her a grade I win, so the (First Lady at Keeneland on Oct. 9) is the plan right now if everything goes right. We'll also consider something at the Oak Tree meet. Beyond that I'm not sure. The distance and the time of the Breeders' Cup is not ideal. Plus, the ground can be soft and yielding at that time of year. But I won't rule out anything. At least we have the opportunity if we want it. Nothing is etched in stone right now. JS; Whatever happens, you must be having a great time with her. BE: The thing that makes it special is that I was the first one on her back and the first one to break her from the starting gate. That makes it so much more satisfying for me. It's like watching one of your kids do well. I would love to have a horse like Zenyatta or Rachel Alexandra, but would it be as satisfying as having a horse like this? Hell no. I raised her. I've been around thousands of horses and being around her is different. You can't fathom the intelligence of this one. It's scary how smart she is. I'm thrilled with all of this, but mostly I'm proud of her. It's all about the horse, not me. If this helps open a few more doors for me, great, but she doesn't owe me anything. She's taken me further than I deserve. God willing, I will be with her the rest of our lives. And if she wants to be broodmare, I hope to see that too.